Which Harry Potter Character does your child want to be for Halloween? Perhaps your daughter wants to be Hermione? Maybe your son wants to be Harry Potter? Well, this Child’s Harry Potter Deluxe Gryffindor Costume will work for both! This Halloween, allow your child to be transformed into Harry Potter, Hermione Granger, Ron or any other Harry Potter Character with this Harry Potter and the Deathly Hallows Deluxe Costume! Your daughter will feel magical as she Trick-or-Treats through the neighborhood dressed as Hermione Granger. Your son will have the time of his life casting spells on all of the goblins! 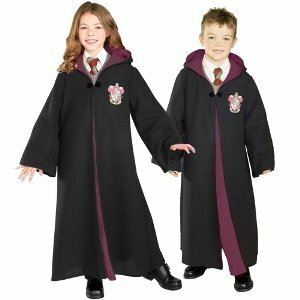 Make your child’s dreams come true this Halloween with the Officially Licensed Harry Potter Deluxe Gryffindor Robe Halloween Costume complete with front close clasp and embroidered Gryffindor Crest!